Once player registrations have started coming into the system, the normal process is to commence grading and assigning players to teams. Majestri has attempted to model this workflow by allowing you to create teams, assign players, and install coaches and managers. Traditionally, committees have been the central channel for all communications, even when related to team operations. We've attempted to break that pattern by making teams self-sufficient once you've put people in charge. We've attempted to devolve the week-to-week administration of the teams to the officials that you put in place, making life easier for everybody. This article is an overview of a the chronology of this process, starting from the construction of the teams from your available players through to the assignment of team officials, and covering the communication tools that both they and the committee have at their disposal. In Majestri, a team is really just a group of related players for management and communication purposes. 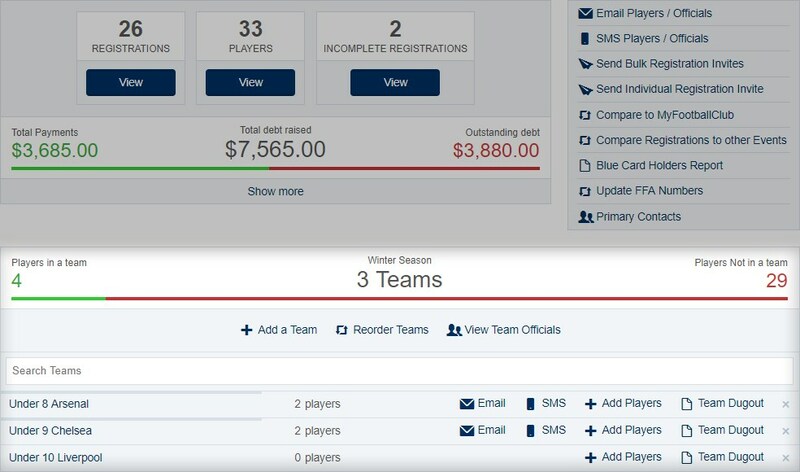 Certainly, most clubs will model their actual teams in the system and that's what we designed this functionality for. Don't be constrained by what you think of as a 'team' though. Any registered players can be assembled into a 'team' for whatever purpose you see fit. With the concept of a 'Team Official', we wanted to empower your volunteers to be able to oversee team operations during the course of a season, but still give a measure of control over what they can do. Therefore, their window into managing the team is not the Control Room (unless they're also on the committee). Rather, it's a dedicated page for their team that lets them do everything they need to. Some ultra-prepared committees know the set of teams they're going to be taking into a season and create them in advance, before any player registrations have actually come in. Regardless of when you do it, the process is the same. Simply navigate to the bottom of your Event Dashboard to locate all of the team management functions. As soon as a team is added, the system creates a dedicated 'Team Dugout' that represents the window into that team for the committee, coaches and managers of that team, as well as parents and players.